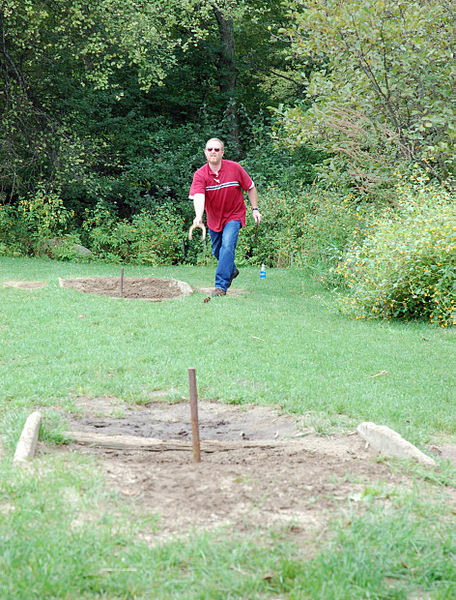 The sport of horseshoes is an American classic – no tailgating party is complete without it. In this guide, we’ll review the 7 best horseshoe sets on the market in 2019. We’ll also detail some key things to consider when buying, helping you to pick the perfect set for you and your family. Photo by Rich Moffitt licensed under CC-BY-2.0. Let’s review some of the best horseshoe sets that you can buy right now. If you’re looking for the best possible horseshoe set that isn’t made of solid gold, look no further. This premium option from Viva Sol has everything you’d possibly want as a horseshoe pitcher. 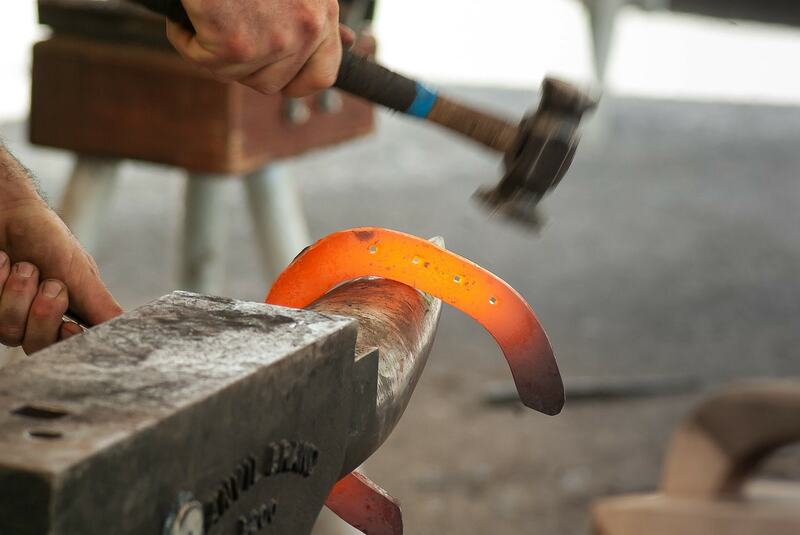 For starters, the horseshoes themselves are made of incredibly tough forged steel. They have a beautiful blue/green finish, which won’t wear off easily (even when exposed to sand, humidity, and/or extreme heat!). Viva Sol have gone for a slightly different stainless steel composite for the stakes, which offers a little extra toughness. This enables them to withstand both rust and hard direct hits, no problem at all. But it’s not just the standard stuff you get with this set. Viva Sol also includes a sturdy, all-wood case to carry your gear around. Perfect for camping/tailgating, the veneer/walnut finish and heavy-duty handles are built to last. This case is also incredibly rot-resistant – it won’t fall apart even if you keep it in a fairly damp area (for a number of years at least!). The only actual downside to this set is its price. In return for the quality you get, Viva Sol is charging a pretty penny. But we honestly think it’s worth shelling out a little more for a top-notch horseshoes set. It sure beats buying a cheap option and then having to replace the horseshoes when they break. Stylish blue & green horseshoes. Sturdy but light carry case included. Horseshoes feel awesome to throw – well-weighted. Expensive – but definitely worth it. Another excellent premium option is the St. Pierre Professional Series set. Although you only get a plastic tote (rather than a full-on wooden case) with these horseshoes, the set comes with a heap of awesome features. Firstly, the horseshoes have slightly more weight in the tips for enhanced stability in flight. They feel great to throw, and won’t begin tumbling in mid-air like some lighter, cheaper options do. Plus, they come with larger hooks to better grab the stake. Secondly, you get a 60-day manufacturer’s warranty with this set. You might be thinking that this isn’t really important – after all, how exactly is a horseshoe going to break in just 60 days? Warranties like this can be valuable because they guarantee the durability of the finish of the horseshoes and stakes. There’s nothing worse than having your set look chipped/worn down after a few games – you won’t have any such issues with this set. The finish itself is available in classic all-American red and blue, as well as a more contemporary bright blue/grey. Both look incredible, and as we mentioned, the paint simply doesn’t fade. Overall, this is an excellent-quality set. However, we’re not sure if it’s worth buying over the Viva Sol horseshoes we just looked at, considering they both cost a similar amount. Looks awesome – two styles available. Durable – finish won’t fade. Well-designed horseshoes – nicely weighted. No carry case – just a tote bag. We’ve looked at a couple of premium horseshoe sets, but what’s available at a lower price point? This set from Triumph is a nice budget option. The cast-iron horseshoes are great at withstanding extreme cold/humidity for extended periods. They don’t have a painted finish, meaning the surface won’t fade or chip – these horseshoes will look awesome for their entire usable life. On the other hand, the stakes have a Hammerite finish. This stuff is basically metallic paint – it’s designed to prevent rust and maintain the metal’s shine for decades to come. You want your stakes to be well-protected – after all, they have to withstand sitting in dirt/sand for hours at a time. What you don’t get with this set is any sort of tote/bag/case to carry your gear around in. This isn’t a big deal – you can simply use a canvas/shopping bag you’ve got at home. The only real issue with this set is its durability. Although the actual finish of the gear is very tough, and excellent at preventing rust, the horseshoes themselves can crack, especially when used on hard ground. If you need something you can use without fear of it breaking, it might be worth picking up a higher-quality option. Stakes have a Hammerite finish – weather & rust-resistant. Looks great – won’t fade or chip over time. Could be more durable – horseshoes can crack on hard impacts. Right off the bat, there’s a problem with this set: it doesn’t come with stakes. If you buy this item, you’ll just get the four horseshoes. So why on Earth would you get this set? Primarily, because the horseshoes are incredibly well-made. They come with not just a layer of blue/red paint, but also an anti-slip, anti-corrosion finish. Not only does this help to prevent chipping and rust, it also makes the horseshoes easier to throw. No longer will you have to put up with the pitch leaving your hand before you wanted it to. What’s more, considering how well-made it is, this set is very reasonably priced. Although you’re only getting four horseshoes (plus an official rulebook), they’ve been officially approved for use in professional games by the National Horseshoe Pitching Association (NHPA). Plus, they’re made in the USA, so you know they’re gonna be incredibly durable. If you don’t already have a couple of stakes, have a look at your local hardware store – you should be able to pick some up for a few bucks. But if it’s too much hassle (or you’re buying a set as a gift), you might want to look for an option that comes with stakes. Durable finish – rust and corrosion-resistant. Feels great to throw – non-slip surface. Another way of getting an awesome horseshoe set on the cheap is to go for something made of plastic. This material is great because it’s reasonably light. If you’ve got really young children, this is something you’ll need – being hit by a metal horseshoe can be really dangerous if you’re a kid. Plus, steel options can be hard for children to throw accurately. The other benefit of plastic is its durability. It obviously won’t rust, and isn’t as brittle as metal (most of the time at least), making it less likely to crack on impact with hard surfaces. Plastic can fade though, so you won’t want to leave it in the sun for extended periods of time. A nice feature of this specific set is how you can use it either indoors or outside. The stakes attach to a sturdy rubber mat, which then has pegs you can use to secure it to the ground. Obviously, the horseshoes won’t feel quite the same to throw as forged steel ones would, but they’re great for casual play. Doesn’t quite feel the same as using a metal set. If you’re a horseshoe pitching pro, you’ll want the best possible equipment on the market. This is another one of those sets that doesn’t come with stakes. 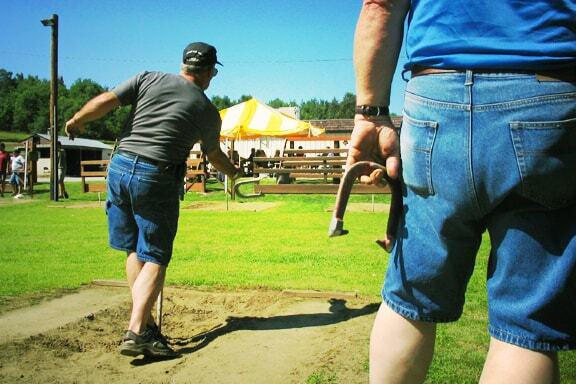 As a serious horseshoe pitcher, Gordon sort of expects you’ll already have specialized stakes, or that you’ll just be taking these horseshoes to local tournaments or casual games. As we mentioned above, you can always pick up a few stakes from your nearby Home Depot if you don’t yet have any. These horseshoes aren’t just tough, they offer incredible performance in-game too. The powder-coated finish is almost completely resistant to rust, meaning it’ll offer consistent grip during its entire lifetime. There’s a 1-year warranty against breakage, and Gordon has had these horseshoes officially approved by the NHPA. Although this set is pretty expensive, Gordon has gone to the trouble of using premium AISI C1035 carbon steel, which has been drop-forged for improved strength. They’ve also used an incredibly scientific weighting process to ensure each horseshoe weighs exactly 2.5 lbs. This is considered medium-weight, making these horseshoes suitable for beginners and more experienced players alike. Feels great to throw – precisely-weighted. Looking for a premium set with a carry bag (and stakes!) at a fairly reasonable price-point? The horseshoes included in this deal from Trademark Innovations are classics. Made of forged steel, they have nice large hooks, which means good throws grab the stake, 99% of the time. They’re also nicely-weighted, and feel very satisfying to pitch. Plus, the quality of the actual steel they’ve used is pretty good – it won’t snap or break easily. You also get a carry case, as we just mentioned. It’s not a puny tote – it’s a fully-fledged duffel bag, with a sturdy handle. If you’re not a fan of the hard wooden case that comes with Viva Sol’s set, you’ll love this bag. There’s not much else we can really mention about this set – it’s a solid all-around option. The price is pretty good (considering what you get) and the actual equipment is very well-made. Just be aware that the horseshoes can chip fairly easily, especially if you use them a lot. This won’t affect how they play – but it will impact how they look. Since they’re unpainted though, any wear and tear will be difficult to spot unless you inspect your gear quite closely. Comes with a large carry case. Hooks do an excellent job grabbing the stake. Photo by David Salafia licensed under CC BY-ND 2.0. Now we’ll detail some key things to consider when choosing a horseshoe set. 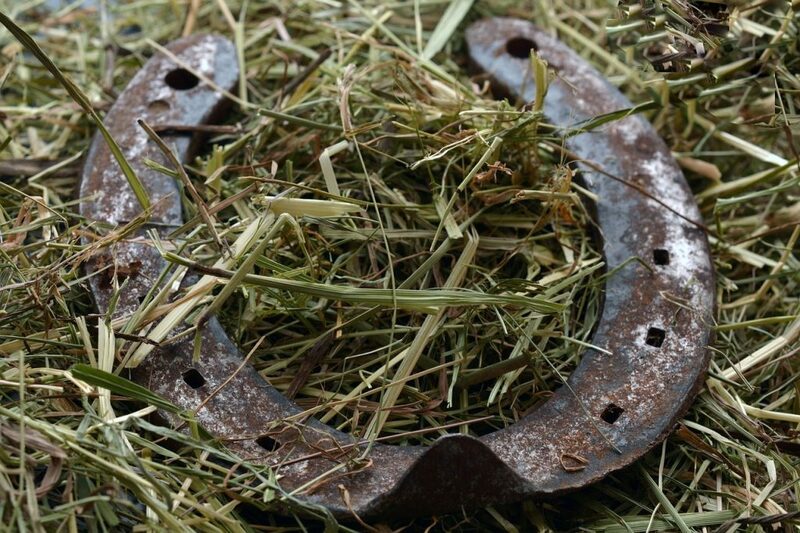 In general, horseshoes (and the stakes you throw them at) are made of steel. In most cases, these options are what you wanna get. They’re durable, feel awesome to throw, and the stake stays in the ground really well. However, these days, there are also rubber and plastic options on the market. If you’ve got young kids who would struggle to throw a steel horseshoe, you might want to consider one of these cheaper alternatives. Another benefit of rubber/plastic is the sets can often be used indoors – typically the stake comes affixed to a mat which you can secure to the floor. This is another thing that’s changed in recent years. Now you can get painted steel horseshoes, including some really awesome designs, like the American flag. No longer are you limited to just having raw, unpainted steel. What color/style you go for is down to personal preference. Just remember though – paint can chip and fade over time. If you’re going to be keeping your set outdoors, it might be worth going for an unpainted option. As you may have noticed when looking online, the horseshoes that are sold in these sets are quite different to the ones that horses actually wear. Rather than the ends being perfectly rounded, these gameplay horseshoes have a little hook on each tip, and are shaped quite square. 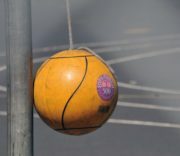 This is to prevent them flying off the stake when you throw a ringer (a toss that lands perfectly around the pole). As a result, it’s definitely worth buying a proper set rather than just using the horseshoes you’ve got lying around in the yard. Horseshoe sets aren’t exactly dishwashers or new cars. But having a warranty is never a bad thing, right? Some options do actually come with a short warranty for a little extra peace of mind when buying. It’s probably not worth spending much extra money to get one with a money-back guarantee though. Horseshoes tend to be pretty tough! What basic stuff is included in each set? 2 stakes. Each should have a nice tapered end to deal with dry ground. 4 horseshoes (2 of each color). This is all you need to begin playing. Note: some premium horseshoes don’t come with stakes. These items are sold under the assumption that you already have a few stakes at home, and that you’re just looking to upgrade your horseshoes. What do I get if I pay a little extra? Most sets only cost $30-$40 or so, but there are a few out there that’ll set you back up to $70-$80. So what do you normally get if you pay a little extra? A studier stake. This is very important – you don’t want it falling over on each hit. A carry case, which can prove helpful for tailgating/camping. Some just come with a little tote bag, while others include a bigger, more durable carry case. A warranty, as we covered above. Tougher horseshoes. We’re not saying if you get a $20 set they’ll literally snap in half on the first throw – you’re unlikely to have major durability issues with cheaper products. But if you pay a little extra, the horseshoes are likely to be more rust-resistant, and will keep their shine/resist fading better (if painted/finished). Whether any of this stuff is worth paying more for is entirely up to you. We’re definitely fans of having top-quality horseshoes though – nothing beats the feeling of throwing something made of solid American steel! In general, if you’ve got a steel horseshoe set, you can leave your equipment outside. You might notice a little rust develop, but your equipment will still play just as well after a winter or two in the outdoors. If you have a plastic/rubber set, or you just want to keep your horseshoes looking at their best, you should consider keeping your set in the garage. Simply put it in the included carry bag/case and leave it on a shelf during the winter. This is the end of our horseshoe buyer’s guide! Hopefully you found the perfect set for you and your family/tailgating buddies. Let us know if you have any questions or feedback in the comments below!